We shall be a mighty kindness..
I’m thinking of this as news is coming in over my news feed about trees—the Archangel project, and cities planting trees, and the fate of our National Parks, right now, and I’m thinking that we can start our year right with poetry that turns our gaze on what is amazing, on awe, on what is shining, on what fills us with rapture. It could be anything, but it seems to me that we have evolved to be able to appreciate beauty, to love, to develop relationships and kinship with species, and that this may not be a coincidence, that we have humans going around overcome with our world and trying to capture it in words—yes, in words that require us to . . .slow down. So let’s begin with poems that bring us to our knees, and us slow down, and poems that have us look down at our feet, and up in the air, and behind the bushes, and at the waving trees in the storm. And our theme will include aspects of our life today we see with climate change, of storms, of scary and traumatic events, and we will see what poets make of these, so that we may experience them in new ways—wind and waves and weather, and scary beasts. We’ll do what Ralph Waldo Emerson, in “The American Scholar,” his call for American cultural independence, said, that inspired Henry David Thoreau, Emily Dickinson, John Muir, and Walt Whitman—among others . . .he said, that we must sing objects, and note those things that sing themselves. Events, actions arise, that must be sung, that will sing themselves. Who can doubt , that poetry will revive and lead in a new age, as the star in the constellation …and this is a new age, a new year . . . Never mind that the idea that January 1 is a new year was just made up by a pope, for political reasons . . . January and February weren’t even on the calendars for a long time, and March-the Spring—was the new year. But we’re busy in March, beholding resurrection, and so celebrating while we’re a little exhausted from the holidays gets us going again with purpose and joy and vigor! And we’ll end with what Rumi means by equating seeing beauty with a mighty kindness . . . if e=mc2 . . . we’ll let Einstein lead us with tremendous eloquence . . . So let’s take off, and slow down . . . 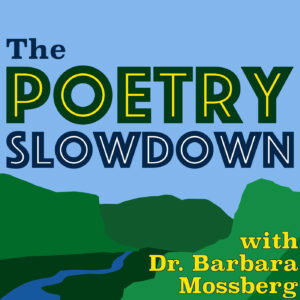 This entry was posted in Podcast, Poetry Slowdown by admin. Bookmark the permalink.